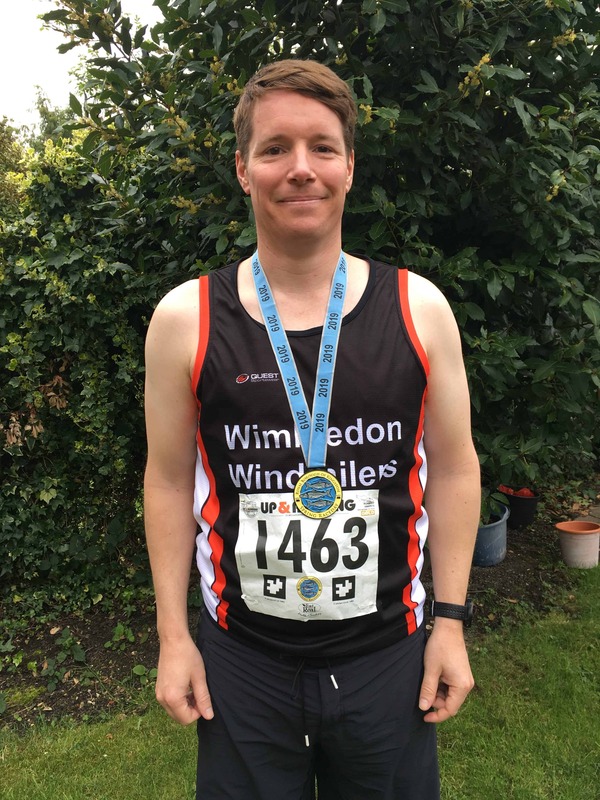 I’ve run the Kingston Breakfast Run as this run was once called once before back in 2010, before my last London Marathon. 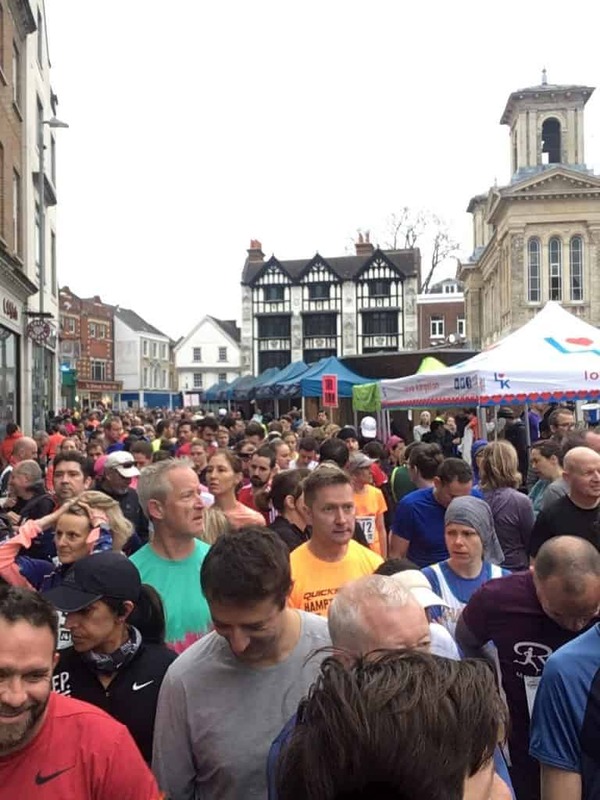 It has been a mainstay for many years for spring marathon runners as it offers a 16-mile race, 4 weeks before the London Marathon and 2 weeks prior to Brighton. I think it didn’t happen last year, but Quicksilver Running, have “re-introduced” the two classic “Breakfast Run” distances this year with runners completing either one (8 miles) or two laps (16 miles) of the famous “Kingston Loop”. It’s called the breakfast run, for a good reason, it starts at 8am! It was a 6am alarm call. Also, Spring Day was it was when the clocks when forward, so one less hour of sleep. It’s the same ritual as always. Kit and bag sorted the night before. Tea, porridge with banana, toilet and out the door. The first train would not get me there on time, so it was the bus. A different experience that got me there in 20 minutes and still full of runners. I grabbed a coffee, wandered to collect my number, got myself sorted, dropped my bag, headed for the toilets and then into the pen. The queue for the toilets was long and there didn’t seem quite enough, I would guess that a number of runners missed the gun, so at least went in a later wave. It was pretty chilly and I had opted for my club vest, but at least I had some gloves so survived the 5 minutes standing in the starting pen. The start was split into waves and I set off in the second with the 9-minute mile pacers. Starting in the famous Ancient Market Place, the run crossed over Kingston Bridge and head up the iconic three-mile stretch of the Barge Walk beside the Thames. The race then reached the magnificent Hampton Court Palace before continuing through Thames Ditton and back towards Kingston Market Place. As you can see, the superlatives stop at Hampton Court Palace at mile 3. The rest of the run was alongside a busy A road, then a very narrow in parts A road before cutting back onto the river for the last mile. Although 2/3 of the course is not prettiest, this race was not about that. It was about a long training run in a race environment. After a strange lap around the outskirts of John Lewis (I guess to make the distance up), I was on the riverside, trying to relax and not get too excited. I kept my breathing regular and ran a conversational pace (in which I could hold a conversation). The field strung out quickly and there was lots of space. I had opted to do a 16-mile race and not the 20-mile long run that was on my marathon plan as I feel the only way to simulate what might happen in a race is by racing. It was a few miles less, but think the quicker miles in the race will have more of a bearing on marathon day. I settled in and jostled backwards and forwards with the runners around me as we sped up and slowed down. Coming in the finish straight and taking the left to do other lap took a bit of will power. Once I was on the second lap and back on the riverside, I resettled myself, took a gel and tried to push on. 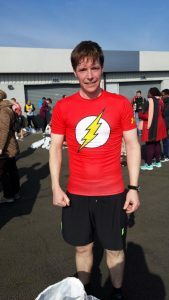 I felt that I picked the pace up, which my splits show, but only by around 10 seconds a mile. I reeled in a couple of runners who had passed me on the previous lap and had an annoying guy who sat a few feet off my shoulder and breathed rather loudly but never passed me. I scooted up the ramp off the riverside on to Hampton Court Bridge and lost him. I held my pace through the latter miles as I pumped in 3 consecutive 8.23 minute miles and still felt strong. Fading in the latter miles of races has been a common thing for me, particularly half marathons. The lack of systematic training being the issue there, but I’ve righted this with this marathon training plan. I kept my powder dry pace wise until getting back alongside the river on the run back into Kingston town centre. I focused on a number of people a fair distance in front of me. I thought I had no chance of catching them, but I did. I sprinted across the line and felt good. Most races I finish, I’m normally pretty relieved to cross the line and thoughts of running any further is the last thing on my mind. I collected my medal and helped myself to a few goodies. I collected my bag and pulled on all my clothes and did some cursory stretching. The race is conveniently placed in the calendar and a very useful training distance. The course is pan flat, much like the marathon and the whole event was well managed and marshalled. The even sub 9 minute pace, strong finish and the feeling that I could do a few more miles is hopefully a good thing. Next Next post: Should you run a negative split?